What’s in a name? When it comes to Hocus Pocus, a lot. Picking a name for a show is usually straightforward. A name usually just pops into my head, mostly because the concept for the show has been percolating in my subconscious for a while. Such was the case with Hocus Pocus. Although the origins of the phrase are murky, it certainly dates back to at least 1624. Some argue that, as spoken word or a magic spell, it was a satirical corruption of the most sacred words in the Latin Mass, Hoc est enin Corpus meun, or hoc est corpus. 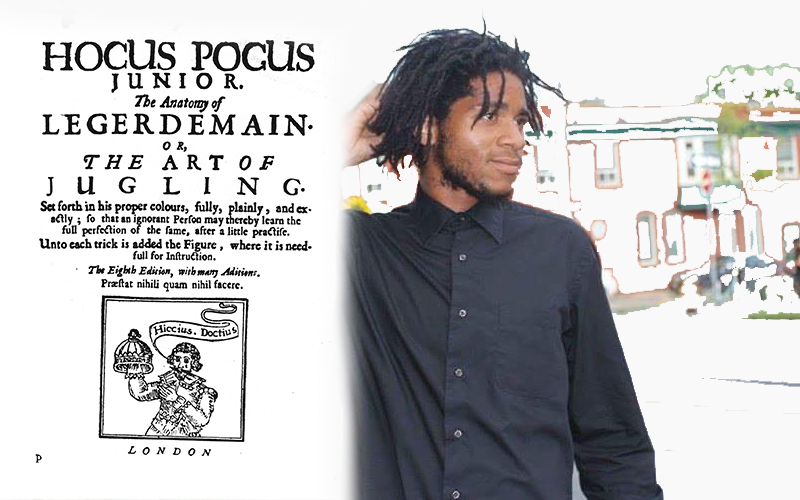 One thing that is for sure is that one of the first magic books published in the West was entitled Hocus Pocus Junior. Published in 1634, it was not only well-illustrated, at least by the standards of the day, but it was also the first magic book to focus on ‘patter’, or the words spoken by the performer, and how they could assist him or her. This led me to La-Vane Kelly, a young Spoken Word artist from Toronto. I reached out to him to see if he would be interested in collaborating on a couple of pieces in Hocus Pocus, specifically providing some Spoken Word inspired by the magic that will be performed on stage. I was particularly interested in layering in Spoken Word with the magic and the music, having been equally inspired by the Spoken Word in the David Byrne-Brian Eno collaboration My Life in the Bush of Ghosts, and by the opening words of the initial recording of Here Comes the Flood by Peter Gabriel and Robert Fripp in the Fripp album Exposure. I just liked the idea of layering sound on sound, also partly from my own experience of seeing Robert Fripp perform at the Bathurst Street Theatre on a Frippatronics tour, playing his guitar, recording sequences on a reel-to-reel player, looping the sound, adding to it, and playing over it, creating a sonic wall with nuance and texture. Fortunately for all of us, La-Vane agreed. So, Hocus Pocus the show contains Spoken Word, literally and figuratively. The result, we hope, will be equally hypnotic. David Ben is the co-founder and Artistic Director of Magicana. Join his discussion as he shares his catalogue of commentary on the creative process of staging a new theatrical magic show. Tickets are now available for Hocus Pocus, produced in association with Soulpepper, December 10 - 31, 2016 in Toronto.